Congratulations on being admitted! 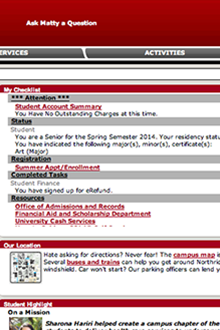 As a new CSUN student, you’ll want to use the myNorthridge Portal checklist to keep track of all the items you’ll need to complete before you can register for classes, including submitting your proof of immunization and any outstanding test scores. The myNorthridge Portal My Checklist feature notifies you if you are missing application materials or admissions requirements such as high school and community college transcripts, declaring your intent to register, and SAT, ACT or English Placement Test (EPT) or Entry Level Mathematics (ELM) test scores. Download the free CSUN mobile app for instant access to a GPS-enabled campus map, virtual tour and employee and student directories. You can also use the app to enroll in classes or and pay tuition and fees from anywhere. We're constantly making updates and adding new features so keep it handy. The app is available for iPhone and Android on Apple's App Store and Google Play under CSUN. 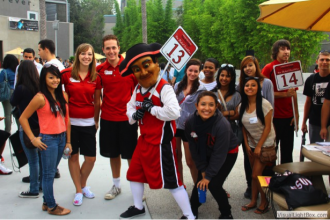 Wear the CSUN colors: red, white and black. Give Matty the mascot a high five. Cheer on Matador athletes at the Matadome. Pick up free CSUN-branded goodies such as water bottles, academic planners and T-shirts from the Associated Students office. Get outfitted with swag at the Campus Store. Join a campus club, or start your own organization. New Student Orientation is mandatory for first-time freshmen and recommended for all incoming students. You’ll receive a notification via the postal service or email with instructions on how to register. As a new student, you must submit proof of hepatitis B, measles (rubeola) and German measles (rubella) immunization before you can register for classes. Find more information about how to submit proof of immunizations on the Klotz Student Health Center website. You will need a student ID card to access services at the Delmar T. Oviatt Library and the Klotz Student Health Center. Get your student ID at University Cash Services in Bayramian Hall 100. The fee is $5 (cash, check or debit card only), and you will need to show a valid driver's license, state issued ID or passport. Check the Student Finance website for hours of operation, and avoid long lines by paying for your student ID online and bringing the prepayment receipt with you for pickup.